If you own a Brother wireless printer, possessing a sound knowledge of how to set it up will help you use the printing machine to its full potential. Read on to find out how to set up Brother wireless printer on Windows and iPad. If you wish to set up your wireless printer from the Brother brand on your Windows 10 computer or an iPad, follow the steps given below in a systematic manner without skipping any step. Step 1: Add Printer Wizard Driver or download Brother Printer Driver from the official website of Brother Printer. Follow the on-screen instructions to do this. Step 2: After downloading the driver, the next thing you need to do is extract it. To execute this task, double click on the downloaded file to open a ZIP Self Decompression window. Now, follow this path: Browse->Choose a path name->Decompress->OK. Click OK only after the successful completion of the decompression of the ZIP file and do not forget to note down the path. It can be useful in future. Step 3: Next, you need to connect your Brother printer to your computer on Windows 10. This would depend on the type of connection you are using. You may either use a local connection or a network connection. If you have a network connection, ensure the machine is linked to the network. If not, then follow this path: Start->All apps->Windows System->Control Panel->View Devices and Printers->Add a printer. Once you do this, the computer machine will run a search for the wireless printers that are available within its reach. Allow the machine some time to populate the list and find your printing machine on the list. Click on “Next”. If you do not find the name of your Brother printer hardware on the list, it could be due to the firewall of the antivirus software you are using or the failure of the machine to identify your printer. Sometimes this can also happen if a wireless printer and a computer are on the same network. You can try out certain steps such as making changes to the settings of your firewall, rebooting the computer or the router. If this does not work, you can either contact the manufacturer of your PC or the network administrator. Step 4: Now, follow this path: Have Disk->Browse->Choose a destination folder->Open->OK->Select the model of your printer->Next. Step 5: If the message that a driver is already installed flashes on the screen, then choose the option, “Replace The Current Driver”. Thereafter, click on “Next”. Step 6: Next, click on “Printer Sharing” and then click on “Next”. 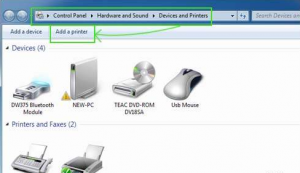 Step 7: If you wish to set Brother printer as the default printing machine on your computer, click on the option, “Set as the default printer”. Step 8: Print test page to find out if all is well with the set-up process. This is an optional step. However, it is strongly recommended to perform this step to be doubly sure about the successful installation of your printing machine to your personal computer. Step 9: If test print looks fine, click on “Finish” to allow the installation of the printer driver. Sometimes a message also appears on the screen stating that the test process could not be completed successfully. If you see this message, do not worry. Click on the option “Continue Anyway”. The process will then start continuing automatically. Before adding your Brother printer to your iPad, make certain that both the devices are within the range of the wireless internet connection which you are using. After ensuring it, you can proceed with the steps given below. Step 1: Launch your preferred app for printing with the AirPrint app on your iPad. Step 2: Next, tap the share icon of the app. It is the icon with an arrow pointing towards the left or vertical direction. Step 3: Now, you can either tap on the print icon or the Print option. There are only a selected number of applications that support AirPrint. For further information, refer to the user manual of your device. Alternatively, you can also gather information about it from the official website of Apple. Step 4: Next, tap on the “Select Printer” option and then select “Airprint-enabled printer”. Step 5: Choose the number of copies and pages you wish to print. Make sure that you view the printing job well. Check whether you have chosen the right type of page and the number of pages that you wish to obtain. Step 6: Next, choose the “Print” option. You can locate this option on the top right corner. If the print looks fine, you have successfully added your Brother printer to your iPad. Regardless of whether you own a Brother wireless laser printer or any other type of printer from the brand, these steps linked to Brother wireless printer setup iPad can be used to add your wireless printer to a computer or iPad. When i try to setup the brother wireless printer in windows i get the following error message – windows cannot access, check the spelling of the name otherwise there might be a problem with your network . to try to identify and resolve network problem click diagnose. I click on diagnose and nothing happens.